Known in Arabic as خط (khuṭ) , literally “line”, Arabic calligraphy is the practice of artistically presenting the Arabic script through handwriting. Using a bamboo pen, called a qalam (قَلَم) master calligraphers combine letters and words to give Arabic script artistic meaning. Calligraphy appears in both religious and secular contexts in virtually every medium—architecture, texts, and jewelry—throughout the Arab world. Various styles have emerged over the centuries that serve a multitude of religious, political, social, and cultural functions. 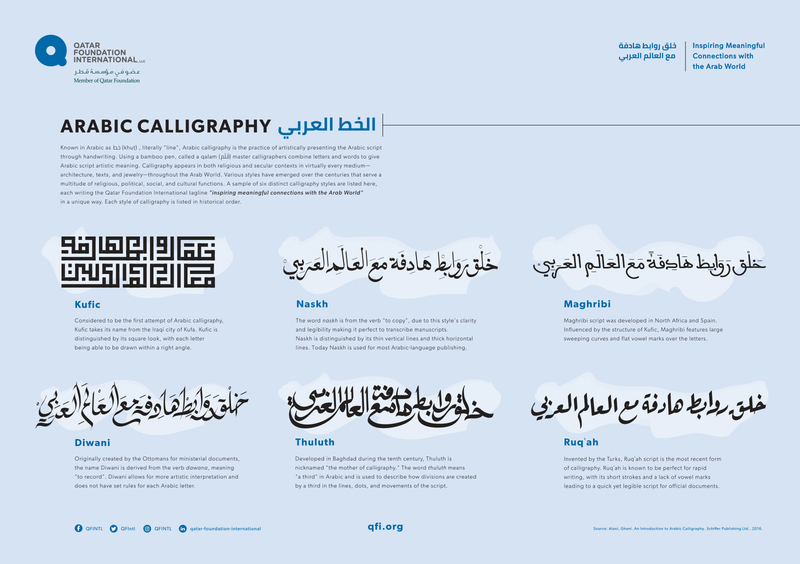 Each style of calligraphy is listed in historical order.